JMS Naval Architects completed the conversion design of a 260-foot manned tank barge into a deck cargo barge for Coeymans Marine Towing of the Port of Coeymans Marine Terminal on the Hudson River in Coeymans, New York. The tank barge was formally known as the MSRC 350 and has been renamed the CMT Y NOT 1. JMS provided complete engineering and design services for the concept through detail design of the conversion and provided owner’s representative services and engineering support to Metal Trades Inc. of Hollywood, SC where the conversion work was performed. All existing on-deck piping and chemical & oil product-based equipment was removed from the deck. All other equipment that needed to remain on deck was relocated. The cargo bin walls were designed to be removable and have been constructed and installed on the vessel. 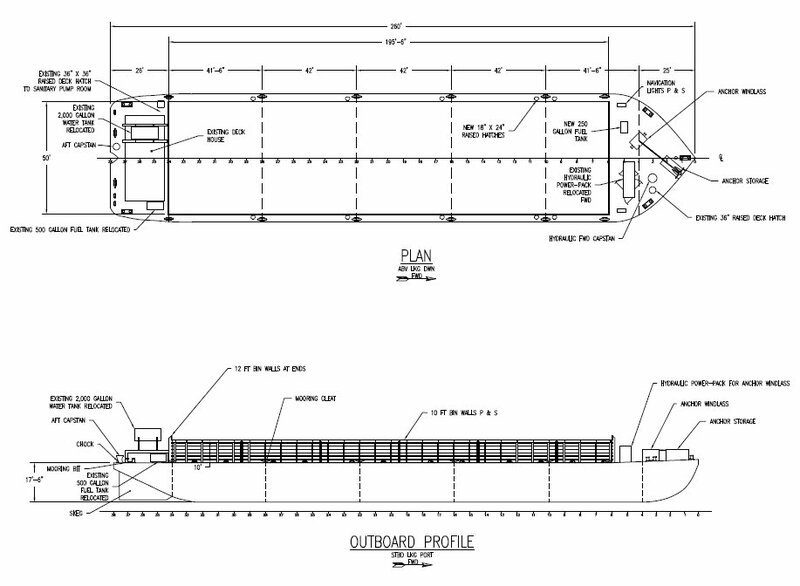 JMS developed engineering calculations and design drawings ensuring the conversion design meets the requirements of ABS Rules for Building and Classing Steel Barges and for the barge to retain is Ocean service Load Line. The design package developed by JMS also included a “Key Plan”, General Arrangement drawing, Structural Analysis, Hydraulic System One-Line, Electrical One-Line, Existing Scantling drawings, Bin Wall Detail Drawing, and Stability Analysis for Load Line. The conversion work was completed this week.